Hi Everyone! I’ve missed writing in this space and interacting with you all! So, a few things have happened since May–I managed to survive working and finding enough activities for my daughter during the summer. School has been in session for almost a month now! My mom had major surgery and came through it well and I am thankful. We had a hurricane/tropical storm this weekend and never lost power, but got an extra day off school! Others are having issues with flooding in our state so everyone wasn’t so blessed, but it was the first big storm to make landfall in 11 years, so I am thankful! It is ALMOST fall and I’m so looking forward to cooler temperatures–summer has been quite hot and miserable this year. And last, but not least I had a birthday! I always feel blessed when people remember my birthday and I’ve enjoyed lots of introverted celebrations. Quiet reading in my corner with coffee, a nice breakfast out with my family, some SUPER yummy orange carrot apple ginger soup (that my sister made for me) and a few surprises! Here are three of my favorite presents that I thought you would enjoy hearing about. First of all –coffee! This summer I’ve discovered that super dark, strong coffee is my favorite. I got a French press, but it was a bit much to try to make coffee in it before getting out the door with school starting. My mom got me this gem–a travel French press coffee cup. You press the coffee right in the cup and its ready to go in no time! Bonus–clean up is SO EASY. And since its red (my favorite color!) that makes it taste even better! I’ve always had a watch, but I had decided to use my cell phone instead for a few years. When I decided that a watch was a necessity again my old one had stopped working. 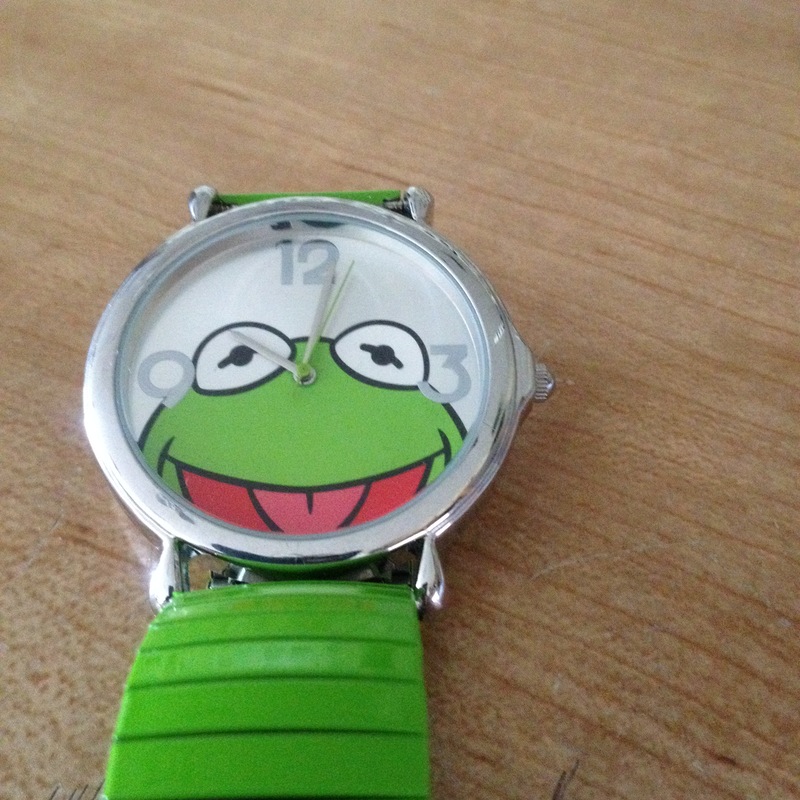 My husband got my this lovely GREEN Kermit the frog watch. It reminds me of my very first watch which was also a Kermit watch–just not quite so green! 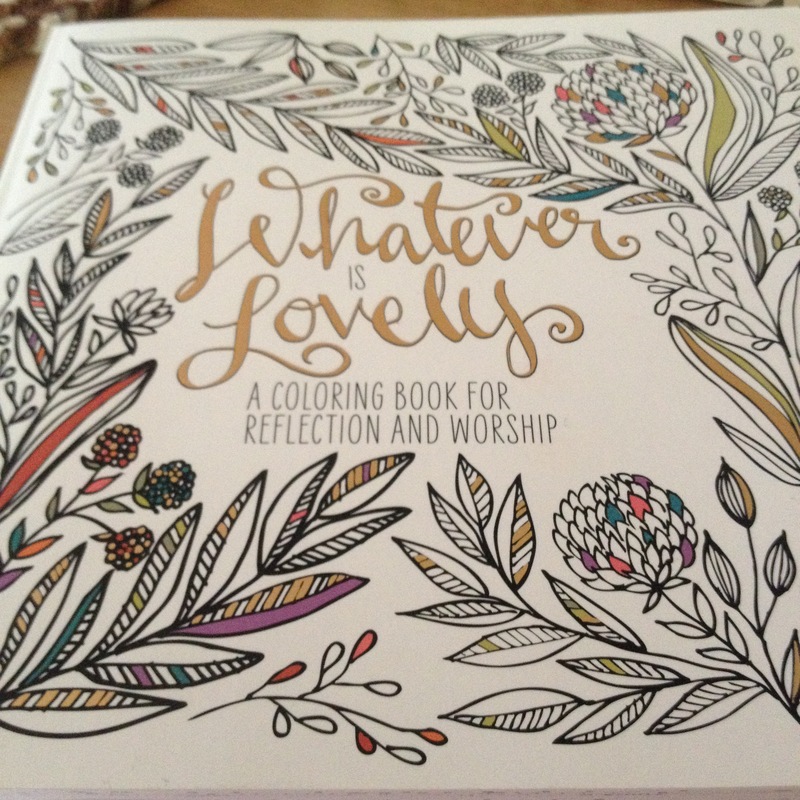 Finally, a coloring/reflection/worship book! I’ve been fascinated by the Bible journaling trend, but haven’t done anything with it probably because lettering isn’t something I’ve taught myself. I LOVE to color though! I can’t wait to start on this book and use it as a stepping stone to deepen my relationship with God. So, what have you been up to all summer? Did you eat great, play hard, and are you ready to jump into the fall season with gusto? Hi Everyone! It’s been some time since I shared some of my favorite things. Enjoy! I’m not usually a huge fan of mixes, but sometimes (when its the end of school and you don’t even want to look at six bags of gluten-free flour!!) you cave in. I was super surprised to see this new brand that has an amazing short list of ingredients and actually tastes yummy too! 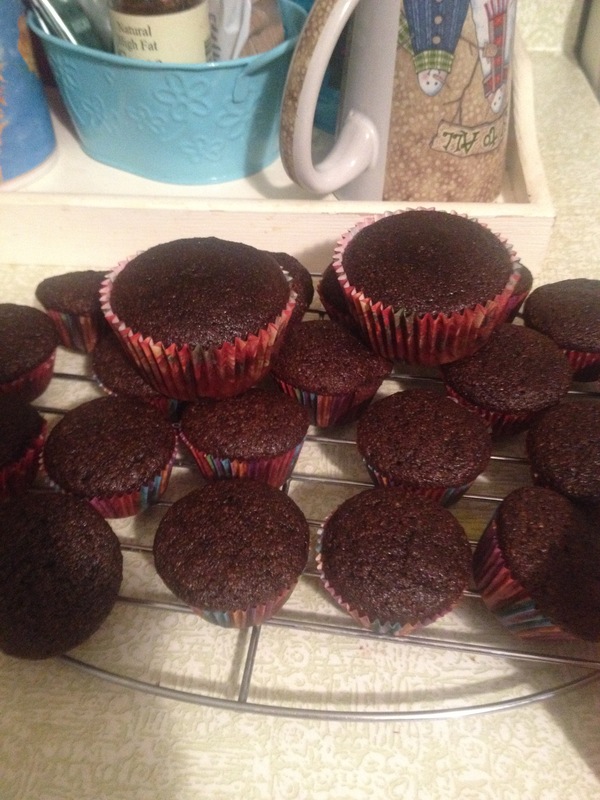 Here’s a picture of the finished chocolate muffin mix: They are available at several different online stores–and they have crackers also! Next is ice cream! I have a weak spot for ice cream and while it is fairly simple to make it, I’ve been buying it occasionally because of time. Have you heard of Ben & Jerry’s diary free ice cream? I have to say it is really amazing–one of my favorite flavors ever actually. 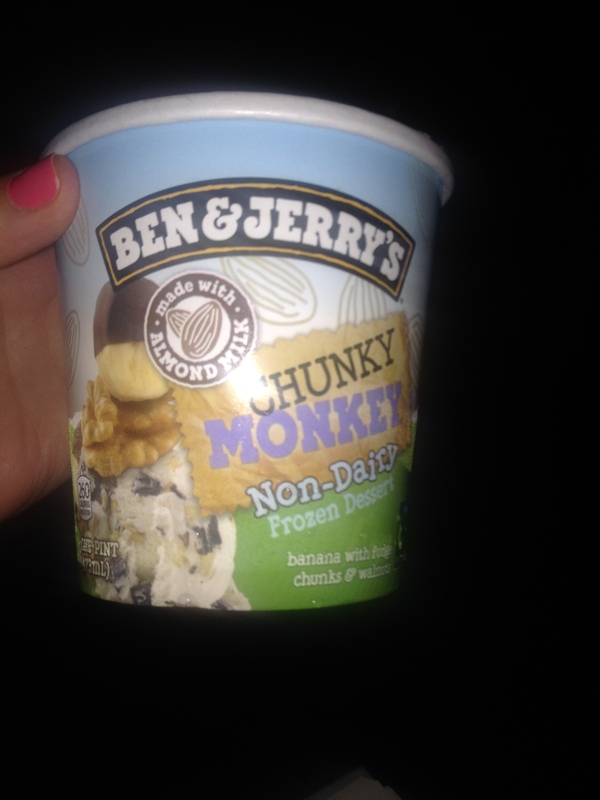 Unfortunately, the Chunky Monkey flavor is the only one that is gluten-free. Maybe there will be more in the future! I seriously have an issue with pens–when I have a favorite you should really not try to borrow it. I have been known to raise my voice if you try! I’m working on it, but after years of working with the public I know how often pens come back! I didn’t know I needed a new pen, but this one has a super fine point and is amazing for writing in the tiny spaces of my planner. Speaking of planners, I recently discovered Inkwell Press. I had a credit to use in their store and I wasn’t sure what to think at first. I purchased the Weekly Kick-start notepad and I am in love. It’s made the past few weeks so much easier with the end of school crazies and getting everyone on the same page–literally! The paper is so nice and thick I can write on with sharpies if I want to and not have it bleed through. 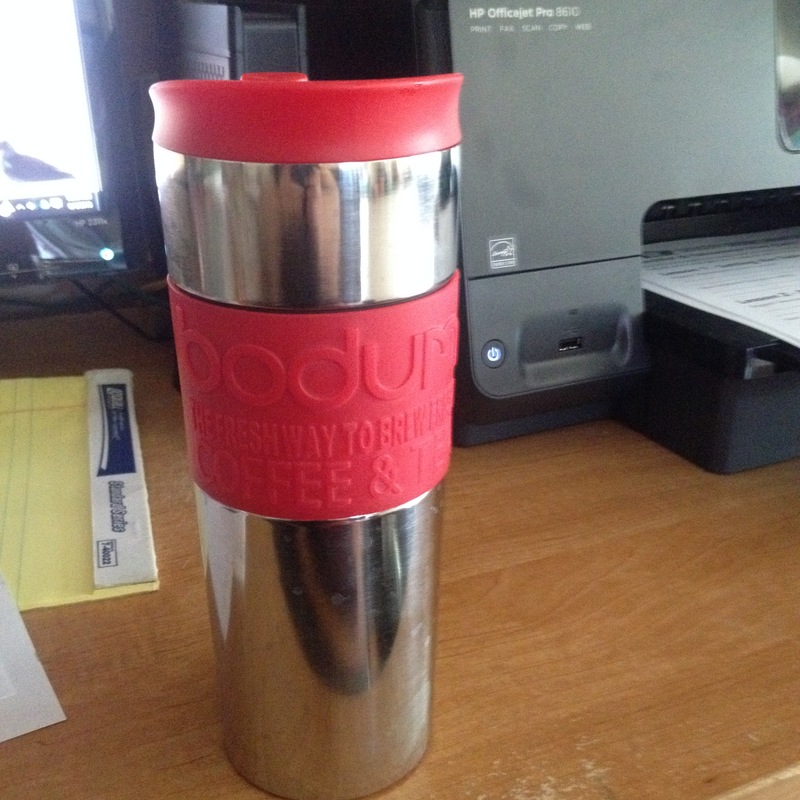 And finally–coffee! When I’ve been drinking hot coffee I’ve been using the Starbucks Via Brew. Which are delightful, but a bit of a strain on the budget. I decided to give a French press coffee pot a try. It has been lovely to get the strong dark coffee taste with a fraction of the cost. It is a bit to have to wash it–just so you are forewarned, but I still love the taste that I am willing to add another chore to my list. What about you? What have been your favorite things for the past month? Do you think you will try any of my favorite things? A friend of mine asked for favorite gluten-free treats recently and I thought…where do I start? I realized my list of favorite Christmas treats was from 3 years ago–before I was gluten-free and dairy free. So since it is time to think and plan and grocery shop for the things you need for Christmas baking, here’s a new list of some of the things I enjoyed last year and some I plan to make this year as I transition to more grain free goodies. This is my new favorite quick bread: Spiced Pumpkin Bread. I’ve been eating it every morning for breakfast and I think it would make a lovely gift in a small loaf or even a big loaf for really good friends! Pumpkin Pie Pudding that is just amazing! I don’t have a vitamix, but it turned out mostly smooth anyway. I love how quick it is to make and I honestly had it for dinner and breakfast in the same 24 hours. You could easily give someone the components for making it in a gift basket. Almond Butter Chocolate Cups…I haven’t actually made these yet, but they are on my to-do list. They look so yummy and they are grain free and pretty low in sugar! Here’s two bars that would easily go in a gift basket: Cherry Chocolate Chip “Kind” Bars and Homemade Chocolate Chip Larabars. I haven’t tried the Cherry Chocolate Chip ones yet, but the larabars are amazing! This Homemade Bittersweet Chocolate Syrup is the best thing ever! This would be a terrific addition to an ice cream gift basket (just add a gift card for the actual ice cream!) or even by itself. I don’t think I even have to talk about how much Creamy Dreamy Vegan (and GF) Peppermint Patty bars are one of the best candies for Christmas Cheer! We make these Grain Free Chocolate Chip Cookies all year-long, but they are great addition to your Christmas Cookie List! Gluten-Free Gingerbread Men were the best cookies I ate last year. They were a huge hit with the Princess even without icing! What is Christmas without a good fudge? This Really Nice Dairy Free Fudge is terrific. I made it last year and I’m planning on it again this year! We usually use an all-purpose gluten-free flour to make our regular sugar cookie recipe, but this Soft Frosted Sugar Cookies are always a big hit too. I plan on making some dairy free egg nog and posting the recipe later in the season! Enjoy your gluten-free cheer! Look around your desk/room/house. Go ahead–I’ll wait until you get back! You saw lots of stuff right? Maybe more than you would like to admit. I know I have too much stuff. In keeping with my theme this year of less stuff I thought I’d share a few of my favorite things. There’s nothing like appreciating what you have to curb your enthusiasm for attaining more stuff. And let’s not forget about being thankful for what you do have. So, in no particular order here are a few of my favorite things. 1. 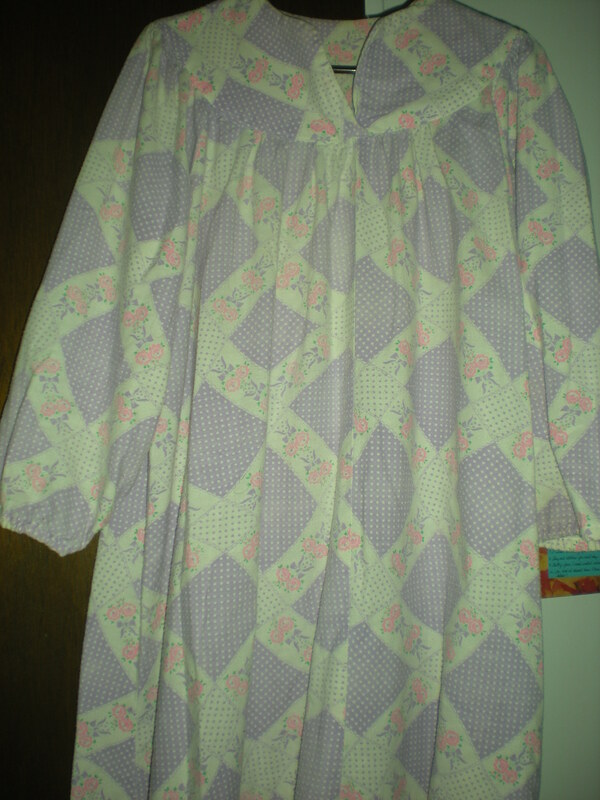 My flannel nightgowns my mom made. They are quite old and will not hold up to close examination. There are holes, worn spots, piling, stains, and all sorts of wear. 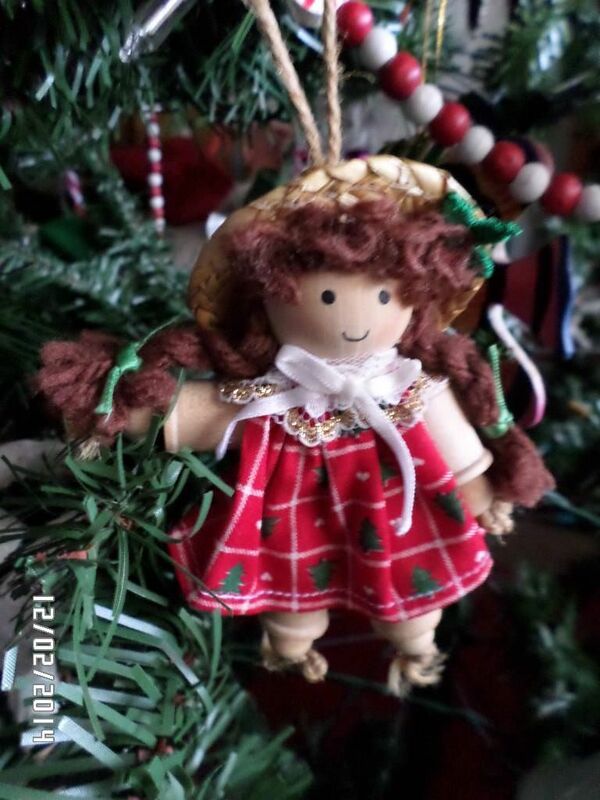 What has not worn out on them is the love that my mom put into them all those many years ago when she made them for me! 2. A book: “The Hiding Place” by Corrie ten Boom. One of my favorite stories of all time. I learn something new everything I reread it. And this edition given to me for my 13th birthday is just the right size/shape and has a delightful map inside it. 3. A lamp. This lamp is terribly old. In fact if my memory serves me right my great-grandfather reworked it from a gas lamp to be suited for electricity. I did buy a new lamp shade a couple of years ago to match the color scheme in my room, but I love this old lamp. 4. This chair. It’s pretty old too and like most of our furniture someone gave it to us. The reason this chair makes me so happy is that I can sit in it and my feet rest on the floor! Only people with short legs will appreciate the enormity of this accomplishment. I think it’s safe to say it’s the only chair that I can do that in my house. 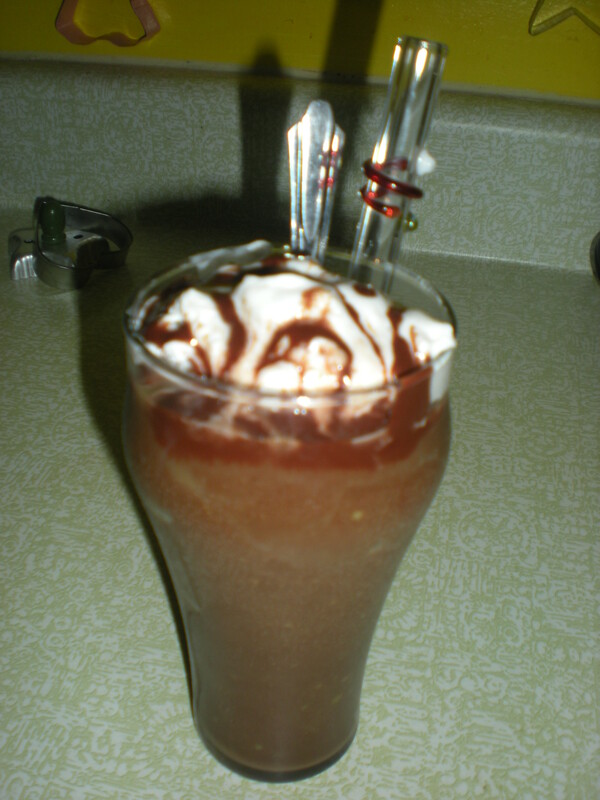 Coconut whipped cream atop a triple chocolate avocado shake! 5. Coconut whipped cream. I was so thankful to find such a wonderful substitute for whipped cream. Now I think I like it even better then I used to like regular whipped cream. Such wonderfulness!